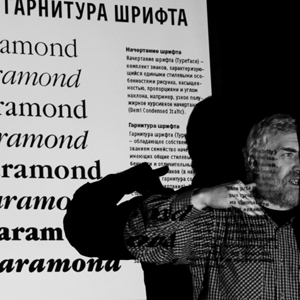 Vladimir Efimov, a typeface designer, died suddenly on February 23, 2012. He was a friend and a mentor to generations of type designers. His fonts are admired by the design community worldwide and have won numerous awards in international competitions. The participants of the round table will share their memories of this special man and his work. The discussion is open. New typefaces: text and display, serif and sans serif, restrained and emotional, austere and eccentric — all projects by the new Brownfox studio aspire to create a vivid, modern and unique typographic impression. A combined palette of typography and lettering allows a piece of visual persuasion to convey a more powerful emotional statement. Occasionally a hand-lettered object makes a stronger impact than a typographically composed headline. As in concrete poetry championed by the Futurists, lettering is an excellent tool to immediately convey emotions and intonations of the author’s voice. We shall discuss visual communication on multiple surfaces, as well as two-dimensional graphics that transcend their spatial confines. Font design will be examined as an object of intellectual property. Font piracy, protection, as well as legal rights of type designers, type foundries, and end users will be discussed. We shall cover the meaning behind font licenses, as well as their types. We shall also discuss some prominent lawsuits dealing with font design in the US, Europe, and Russia. We will analyse current typographic trends in Russian magazines: which typefaces are most commonly used and why. We shall examine whether trendy fonts affect sales and we shall investigate who is really responsible for the magazine house font selection. We shall examine typographic awareness in Russian art schools, discuss the five ways to motivate and to demotivate a student, raise ethical issues in Russian body art, and touch upon safety precautions in using carpentry tools. 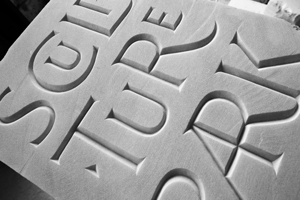 Type and Typography curriculum at the British Higher School of Art and Design was developed for practicing communication designers who wish to advance their skills in type and typography. Two fragile young ladies will teach you how to chisel letters into slabs of marble, while two macho men will show you how to create elegant calligraphy with quills and supple brushes. Today’s type designers routinely adopt the familiar shapes of Cyrillic letters that predominated in the late 19th and early 20th centuries. A variety of alternate historical forms remains untapped. This presentation will investigate key milestones in evolution of the Cyrillic typographic letter over the past two centuries. We hope the increased awareness of the variety of historical character shapes will provide type designers a greater opportunity to find precise and period-appropriate design solutions. Resulting solutions could go a long way to expand stylistic range in Cyrillic typography while maintaining historical integrity. Is there a life after FontLab Studio? A sneak peek into new type design software tools to come from the creators of the market leading FontLab. Although the technology of Web fonts embedding has changed little since 1998, their active use became possible just a few years ago, as soon as all major browsers had agreed upon the support of specific font formats, on one hand, and these formats were found suitable for the type founders, on the other. 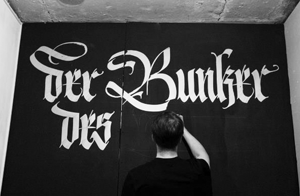 The flourish is a part of typographic tradition and an art form to itself. Originating from character extensions and calligraphic exercises, it went on to assume its own esthetic value. Typographic ornaments, monograms, initials, and logos are some of the current places one flourishes. This presentation will examine the history of the flourish, its classification and rules of construction. It will explore its appearance and distinct structural features corresponding to various hitorical styles: Renaissance, Blackletter, Baroque, Skoropis’ (Batarde), etc. It will also touch upon calligraphic elements adapted to display and text types, and look at how the archaic swash forms are absorbed into current typographic culture. Everyone has heard of Sherlock Holmes’ deduction methods but can anyone explain them? Surprisingly, the job of a consulting detective and that of a type designer have lot in common. How can we apply deductive reasoning to type design? Which details deserve most attention? Does a type designer need the Police News of the Past newspaper? This short and subjective talk will search for some clues. A philosophical discussion of calligraphy as an expression of individuality. We will discuss metal composition, the influence of tools on the appearance of letterforms; the human element, thought processes, memory patterns, synesthesia, designer’s hand, the line living and lifeless, computers, and vector shapes. We will talk about the importance of human touch, embodied in a living line. This presentation will focus on the unique historical path of the Cyrillic script, as distinct from its Latin counterpart. Its close connection to and its tight control by the Orthodox Church, as well as its initial ecclesiastical application will be discussed. Subsequent civil typographic reform that has wrestled typography away from the church and entrusted it to the state will be examined, with conclusions relevant to today’s Cyrillic drawn. Let’s imagine that the type is a chicken and the letter is an egg. One may not be particular about the quality of the eggs, as long as they do their job in the dough. However, if one becomes more health-conscious, one begins to consider the chicken’s rating, size, lifestyle, and food. Some diets eschew eggs altogether. In other words, there are different goals and different means of meeting those goals. Real life case studies from DesignDepot studio and [kAk) magazine. When I was a kid, my favorite painter was Victor Vasareli. I spent a long time studying optical illusions, and, in particular, linear textures, which led to the creation of the Opticum type that could change its readability depending on the context, point of view, and other external factors. I used this font in posters and logos, Christmas cards and book design. The typeface was released by ParaType in 2008. This presentation will discuss the typographic logo as an effective, and perhaps a more universal, alternative to the mark. We will demonstrate real life examples of this leading trend in corporate identity. Important qualities of today’s typographic identity will be covered: non-linear storytelling and priority of the visual structure over grammar and spelling. We will touch upon typographic identity in regional branding. Mummy, I Want to Write! We shall describe calligraphy lessons from an aged postal clerk, Sgt. Protsenko, designers Gannushkin and Lazursky, two construction workers, and a sofer. We shall discuss the lettering artist’s lifelong contract, as well as the nonspecific relationship between writing, calligraphy and typography. Brought to you by the man with no handwriting.